Dickies taken the sturdy construction of their best-selling men's Original 874 and re-engineered the fit for women in the same easy-care, fade-resistant fabric. Ladies, your version sits slightly below the waist with a traditional fit through seat and thigh with a straight leg. The tough poly-cotton twill resists wrinkles, releases stains. It's a clean, straightforward look versatile enough for women in all types of work, from firefighters, corrections officers and food service staff to teachers, grocery clerks, veterinarians and more. These pants features: Sits slightly below waist, tradtional fit in seat and thigh, straight leg, easy-care poly-cotton twill resists stains and wrinkles, resists wrinkles, easy care stain release, wide tunnel belt loops give extra support, less likely to rip, two piece waistband for a better fit, flatteringly flat, welt back pockets, dyed to match button secures left back pocket, hook front closure lays flat, stays secured, ratcheting brass zipper. Material: Twill, Cotton, Polyester. 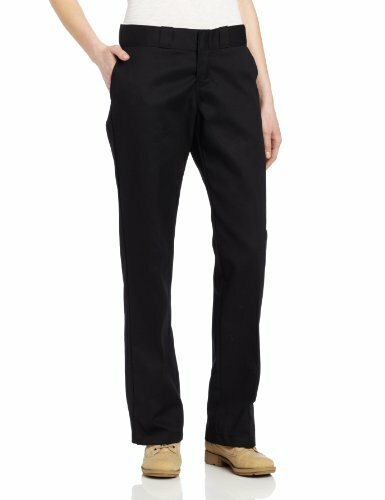 The waist band is a work pant waist band or straight waist band. It is not contoured.